Type:VideoLanguage:EnglishCategories:Personalities FeatureStatus:On going Description： Turn open any dictionary and one will commonly see the word “happiness” as simply referring to any subject’s general “state of well-being and contentment”. One could thus argue that as opposed to our modern-day social interpretation of the word, “happiness” by its most original definition, was never intended for any existing ties with precepts of money or material wealth. And in the case of Hong Kong, where by the attempts of recent research to gauge the city’s general state of happiness, the argument seems to hold all the more true. 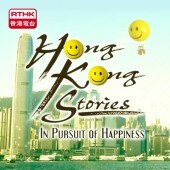 The new season of Hong Kong Stories – 'In Pursuit of Happiness' features the special recreational lives of more than ten groups of citizens from various sectors and social strata of Hong Kong. By documenting closely the groups’ diverse and unique pursuit of interests, and inviting selected participants to reflect upon and share their views of what happiness means in their everyday lives, the show attempts to be a record of first-person experiences whereby the sharing of those happy spaces might urge a viewer to revisit an old cliché of saying that perhaps you need not search the ends and all the riches of the earth to find happiness, but is anything and everything as your heart freely chooses to define. At the end of the day, it’s the same tale about opening up the eyes of one’s heart as a way to true venturing into bigger spaces beyond our own; a worn pair of shoes, a writing brush just like an old friend and a familiar smile from a neighbor could all become easy treasures of the heart. Films and Comic books are all good forms of entertainments, for some who come to love the characters and the world created therein, they might even want to follow and re-watch their favourite episodes from time to time just to reminisce; but for some, they may love these characters so much that they would do everything they can to become these characters themselves! In order for the perfect hero of their dreams to appear before the world’s eyes, cosplay lovers would do everything from collecting, trimming and sewing all kinds of special fabrics and materials together to create the perfect costumes for themselves. For this specific team of “Superhero” cosplayers covered in this episode, some even choose to gym up their physiques every week, and train themselves to learn the mad battle skills of their favourite heroic character. Once transformed into the superheroes of their dream, they often find themselves surrounded by swarms of people, vying to take photos with them. Some may say that popularity is cosplayers’ greatest source of pleasure. Yet as our episode delves into the reasons behind their happiness, we may discover together with these heroes that perhaps, as they look back at their own pictures of memory, the true joy of playing hero has never really stemmed so much from playing pretend but more from the ability to put smiles on the faces of the people around them. Look closer and you will see that happiness actually is this simple.